Perhaps one feature of today’s music model where control is devolved by default to artist level is the trend for a more experimental approach and a tendency to refrain from being boxed into convention. Frequently artists fuse particular styles leading to an increased use of the word ‘tinged’ when it comes to music description. While the first sentence can be wholly applied to the new album from Canadian singer-songwriter Sarah Jane Scouten, the fused approach is generally bypassed in the assembling of twelve highly distinctive tracks which form WHEN THE BLOOM FALLS FROM THE ROSE. The result is a collection of exceptionally infectious and independent tunes spanning the genre sounds of country, folk, rockabilly, pop and even a slice of old time rag. Indeed Sarah Jane Scouten is a heaven sent dream for a contemporary folk festival where audiences are more than open to a diverse range of styles. This is further made viable by the high calibre of music that she makes, whether through her own writing or an acute perception to select the compositions of others. On this new record, there is a ten-two split between original and cover material with the latter pair falling clearly into folk music territory via their historical storytelling existence. ‘Britannia Mine’ is an impassioned minimalist song written by Paddy Graber, a person directly involved in a bitter industrial dispute in the western Canadian province of British Columbia, which inspired the composition. The other folk song moves slightly east in its origin to Alberta with ‘Where the Ghost River Flows’ being a haunting rural tale penned by Jasper Joe Adams. 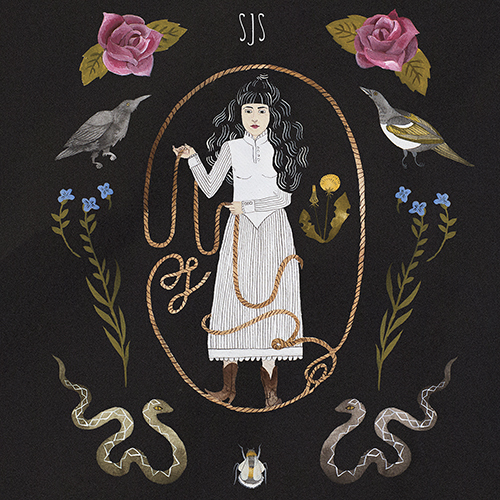 Sarah Jane’s own dip into this genre style comes in the form of the uplifting folk rock title track ‘When the Bloom Falls From the Rose’, the melting vocals of ‘Rosehips for Scurvy’ and the curiously titled ‘Poland’. The latter focusses on the frequently used theme of love with the title taken from the line ‘if you were the king of Poland I’d be the consort of the damned’. Having seen Sarah Jane live when she toured the UK in a low-key capacity a couple of years ago, her extraordinary ability to impart a classic country song can be 100% certified. This side of her multi-appeal shines brightly on the record with the opening track ‘Acre of Shells’ being a prime candidate for the album’s golden moment. Pedal steel, a waltz-like feel and imaginative writing create an excellent love song, blossoming with the chorus line ‘how could I ever love somebody else, in an acre of shells you’ll find just one pearl’. The superb ‘Every Song I Sing’ and the alluring narrative piece ‘Paul’ are other key components where Sarah Jane plays the country card with great skill. The eclectic nature of this album is set to escalate further when we get to the raucous rockabilly number ‘Bang Bang’. This track ratchets up the pace of the proceedings in the number two slot on the running order with an enormous jolt of energy. This has also been selected as one of the promotional songs, which while being a sensible choice, is not necessarily representative of the general tone. Neither is the old time feel to ‘Coup de Ville Rag’, but like the other song in this paragraph, its isolationist nature enhances the broad feel to the album and boosts its overall appeal. Just when you feel this record could not get any further diverse within its pre-defined boundaries, it takes you in a dreamy pop direction with ‘Man in Love’; another fine song that could be shortlisted for the standout moment. The album closer is probably the toughest track to define, but the serene sounding ‘Crack in Your Windshield’ is another example of Sarah Jane’s smart song writing and ensures the record ends on a positive note in its attempt to seal the deal with the listener. WHEN THE BLOOM FALLS FROM THE ROSE is an album that will plant a smile on the listener’s face. It successfully calls at many stopping points without watering down its fascination.Sarah Jane Scouten’s take on music presents a mine of informative song writing laced with an eclectic soundtrack covering many folk, country and other bases. The result is an album packed with potential to flourish intently and it will be a fabulous acquisition to those who cross its path.